← In a noticeable new trend of secret meetings, diabolic greed-driven globalists could be planning your demise. Although I have an on-going post Smart Meters – Are They? What about the Customers? (Draft) documenting the smart meter saga at my residence, it gets a bit unwieldy as it gets larger. So I am trying updates separately and will later combine the whole lot. The latest progress involves the purchase of an EMF radiation meter. This will enable initial measurements of current non-meter radiation for comparison if/when meters are installed in neighbour’s houses and IF I cannot avoid having one installed. The meter has been purchased on e-Bay for about AU$170 and might have been only $140 had I had a working PayPal account. It is a ‘Tenmars’ model TM195 covering below 900MHz and above 2.4GHz, the two relevant bands. The most striking revelation so far, apart from finding my microwave oven may be a danger, is that measurements at my daughter’s house in the country reveals her smart meter to be radiating almost continuously at low levels BUT pulses regularly every minute at what I think are very large levels. 5 metres from antenna measuring towards it from the West: (Measuring power density maximums, resetting at the noted time, between maximums reading generally < 1.0 uW/cm2 and at worst < 1.0mW/m2. Length of time of maximum or a bit under, not ascertained. Moving closer to 2 metres and changing units to V/m (electric field strengths): (Door closed both these sessions). Move to 30cm from antenna, door open: In between pulses continuous levels are around 50mV/m. Have yet to ascertain relative dangers, but a most significant factor is that Jemena are saying readings are logged every 30 minutes and transmissions are only 4 times a day! 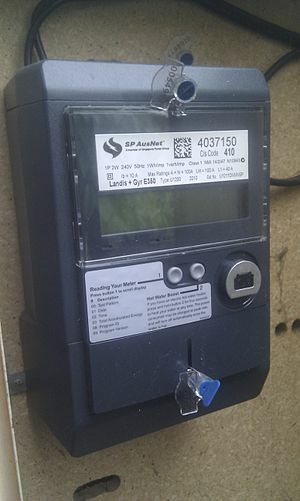 The country meter is attached to PowerCorp/CitiPower who may use different meters and transmitting schedules, so no absolute conclusions yet BUT this looks very suspicious. “Not a smart meter at all. Check your energy bills! That’s David’s advice. Obviously, I am unaware of the company or locality, but, this customer is not happy, has had trouble in receiving appropriate service and that’s not even touching on radiation. In summary, there are real issues with smart meters that we could well do without! This entry was posted in AGENDA 21, AUSTRALIA, ENVIRONMENT, HEALTH, radiation and tagged Agenda 21, Australia, EMF RF radiation, Energy, Equipment, Jemena, Smart meter, Utilities. Bookmark the permalink.